Hauling wood from land to sea. 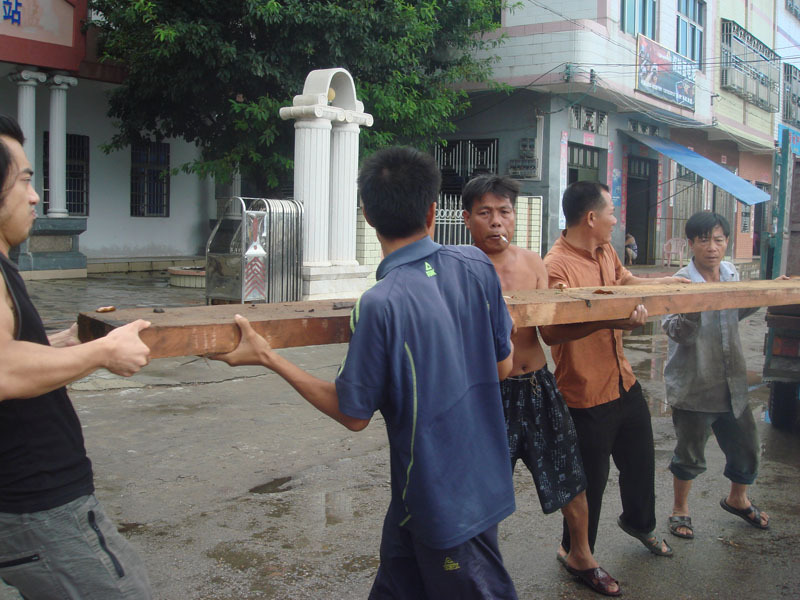 Unloading long planks of wood at harbor. 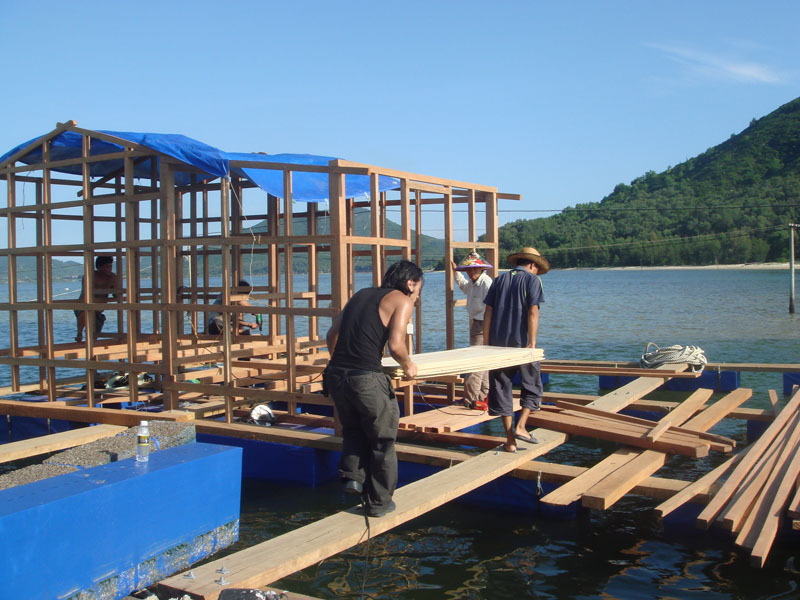 The foundation made of wood and kept afloat with styrofoam blocks. Monkey Island in the background. Framework of medical treatment room. 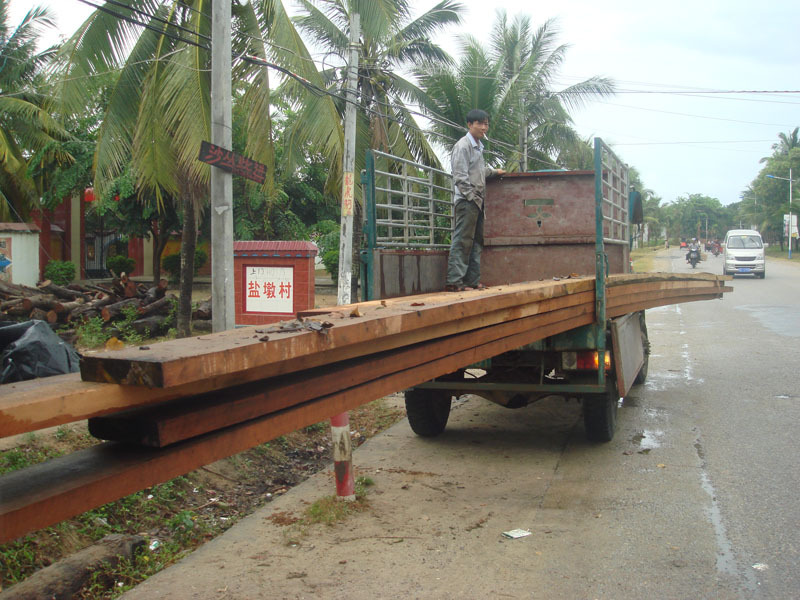 Installing long planks of wood. 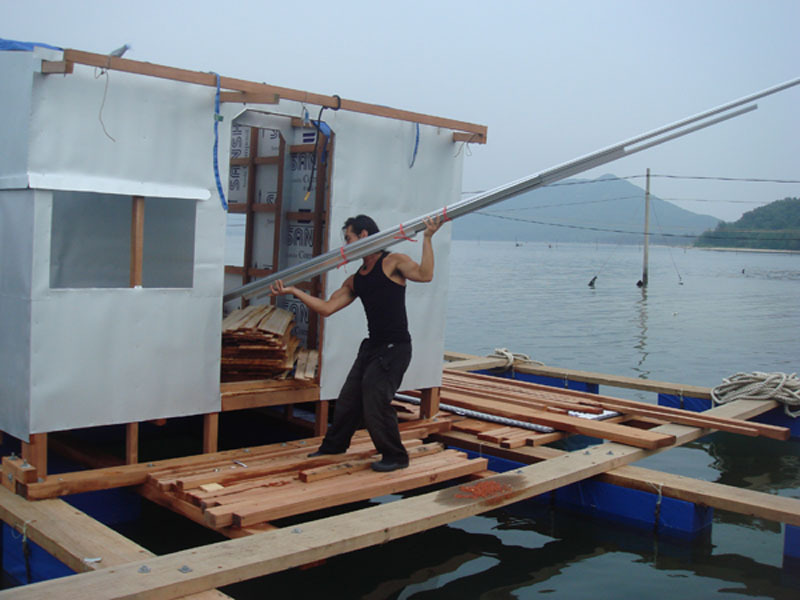 Pushing styrofoam under wood to keep afloat. 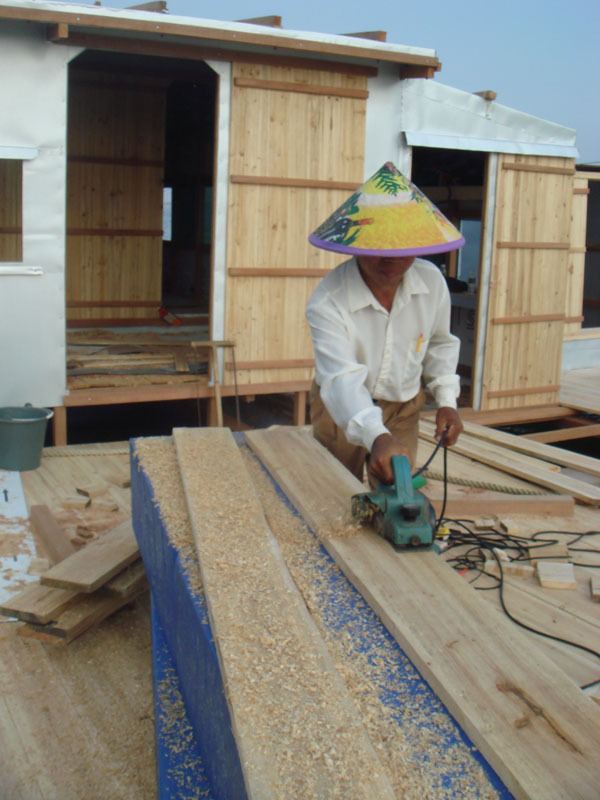 Cutting wood to install floor panels and doors. Construction complete. 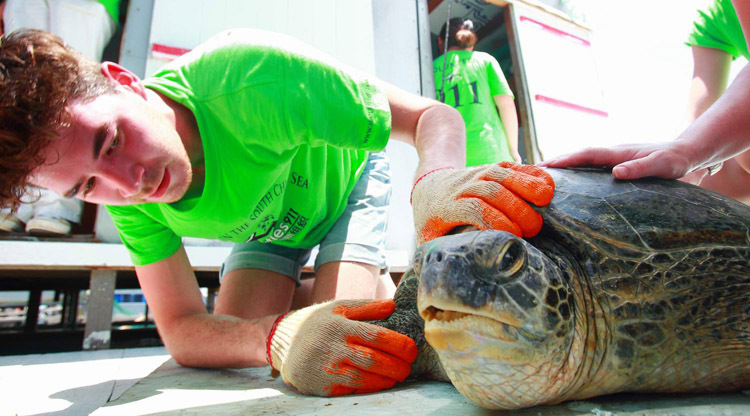 New hospital for sea turtles! News report featuring the floating hospital. 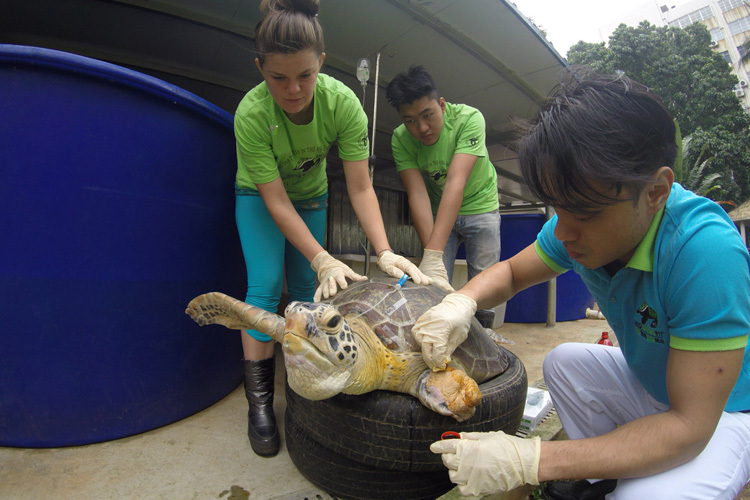 Our floating sea turtle hospital is nestled in a floating fishing village on the coast of Hainan Island, China. 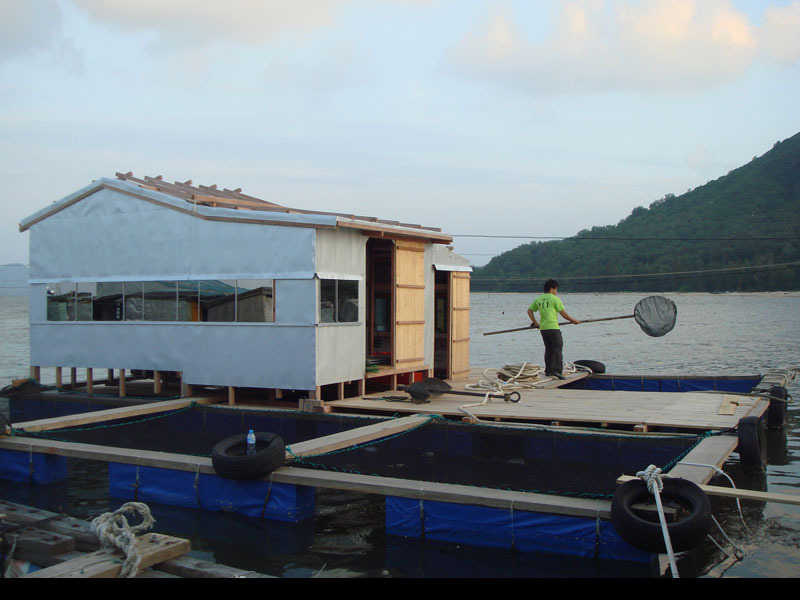 The fishing village is literally floating on the sea, where the residents do not need to set foot on land in their everyday living. 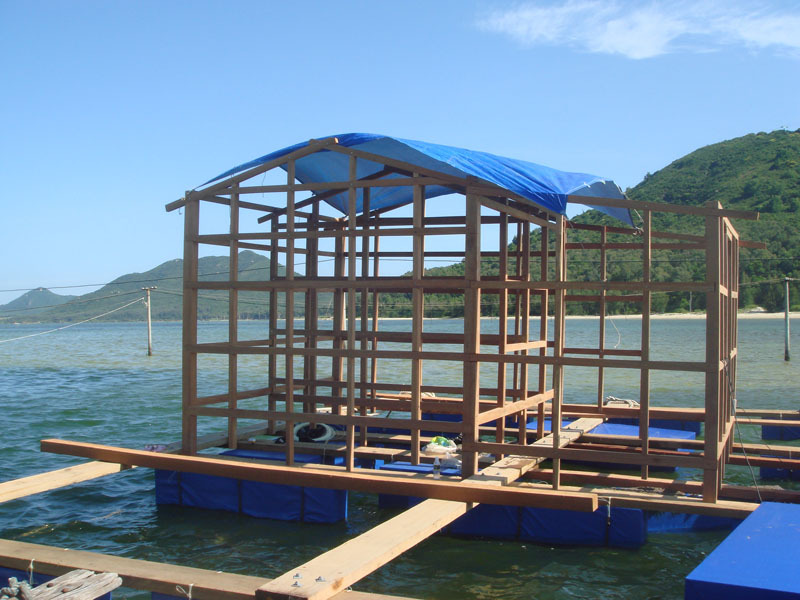 This community on the sea has their own restaurants, convenient stores, post office, and even a floating police station. 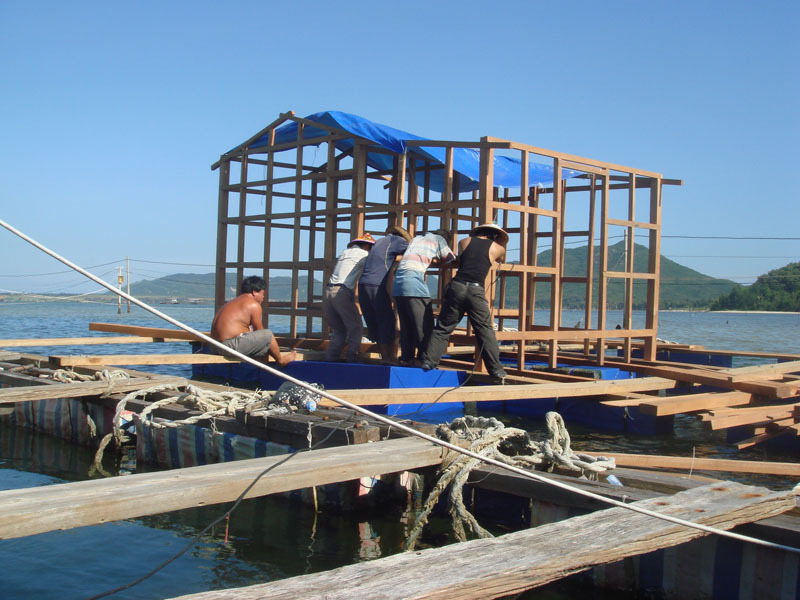 The residents earn a living by fishing and ocean farming. They live their day to day life as if they are on land: watching television, cooking, showering, and even caring for pets such as dogs that guard their property at night. 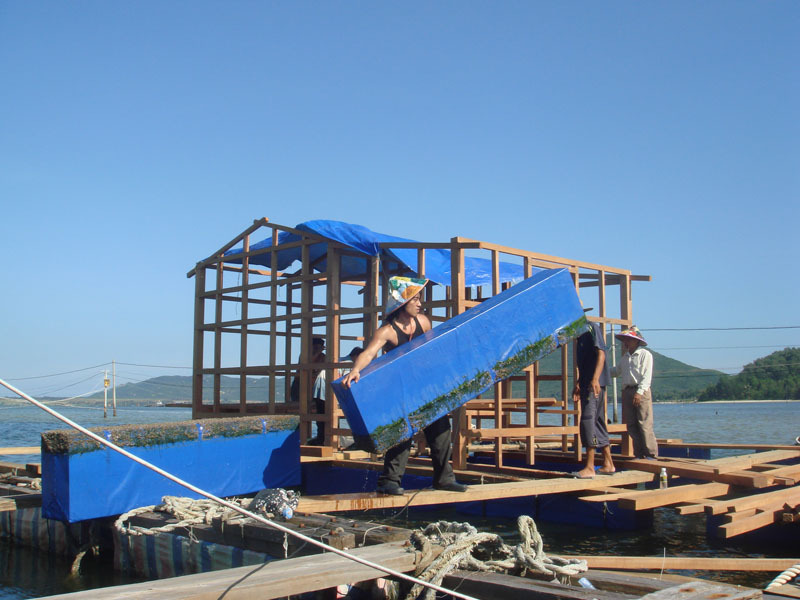 Like many of the other floating homes in the village, our sea turtle hospital floats upon sturdy wooden planks tied to blocks of styrofoam. 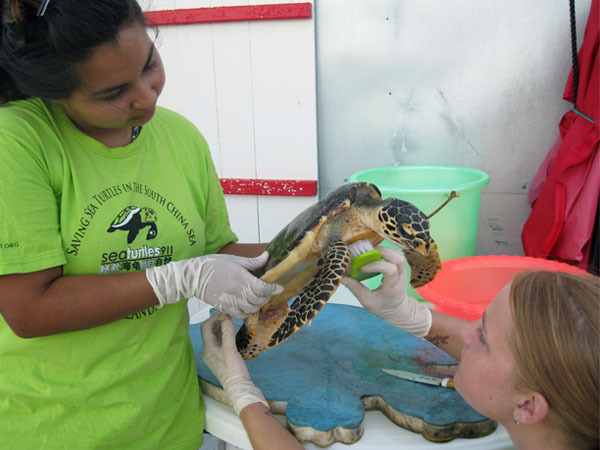 Fishing nets are suspended below the wooden planks to act as tank enclosures for our sea turtle patients. 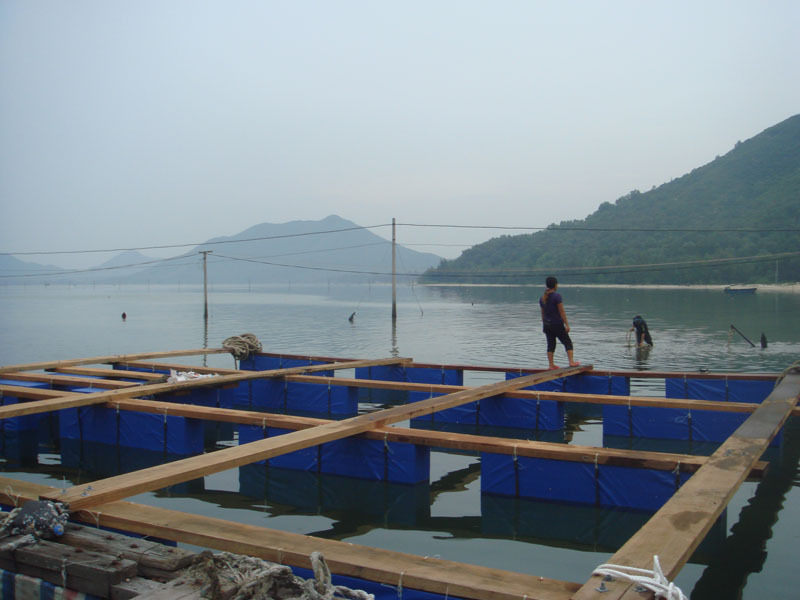 The major advantage of this type of net enclosure compared to an on land aquarium or tank enclosure is that water circulation is ideal; water pump filtration is not necessary since ocean water is naturally always flowing through the net enclosures. Needless to say, mixing artificial salt is something of the past since ocean water is so conveniently there! 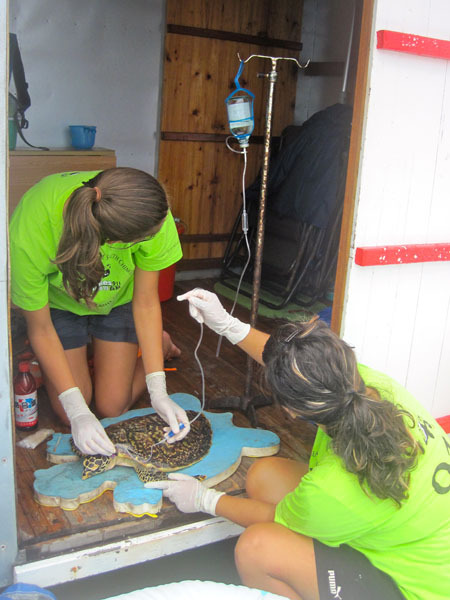 For conservation purposes, our floating hospital includes a nursery for baby sea turtle hatchlings that are part of our Headstarting program. 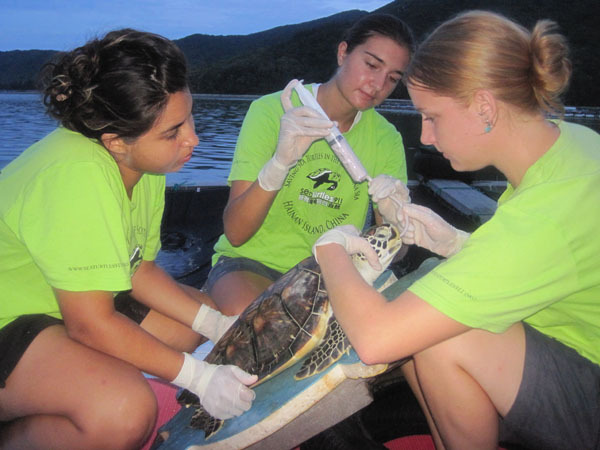 Due to the high mortality rates of hatchlings in the wild, we raise hatchlings to a suitable age for release into the wild as one of our conservation strategies. 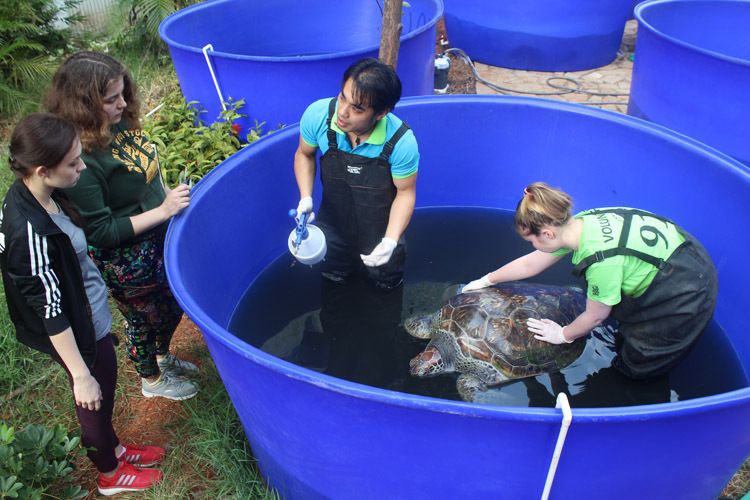 Established in 2015 at Hainan Normal University, the university sea turtle hospital is located on campus near the biology department building.